This page to be updated soon. It will include the history of our sports teams, plus the Uplowman Show, Flower and Crafts Show and the Uplowman Women’s Institute. The current skittles teams play their matches at the Redwoods Inn in what looks like a Dovecott but was once a butchers shop. There are several teams, both men and women, either playing for the village or the Redwoods. The first recorded games were held at Widhayes Farm just after World War 2, thanks to the Batting family that still lives there. 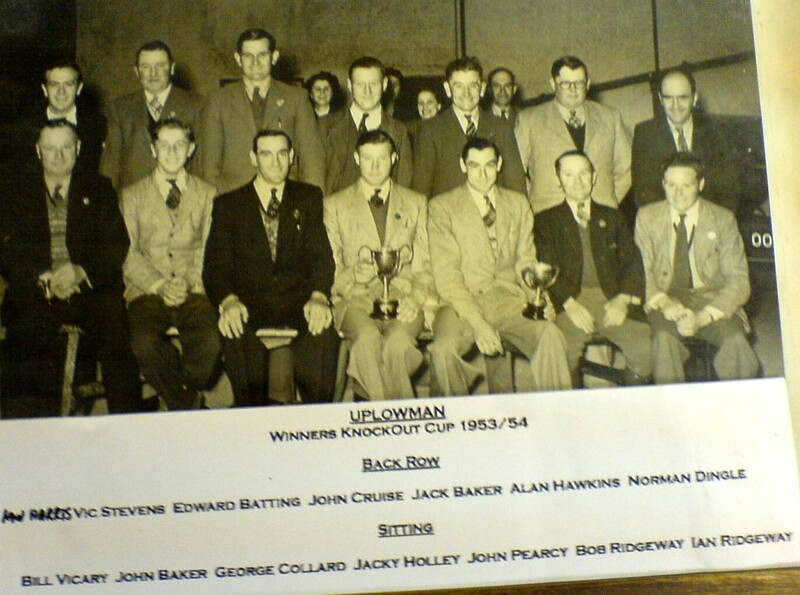 This is a photo of the winning 1953/54 team. And this is another of the 1990 team. Uplowman Athletic play in the Devon & Exeter Football League. In 1992 Phil Adcock, who had played for Tiverton Town, Enmore and Willand Rovers, and Andy Bolt who had played most of his career at Westexe, sat in the Redwoods, over a pint, and decided to start the club. Derek Palmer was the landlord of the Redwoods at the time; he also owned the field where the pitch is today. He was happy for Phil and Andy to get something going using the field and, what was, the old bar at the Redwoods as changing rooms and showers. Andy went straight to work preparing the field for friendlies before they entered into the Exeter and District Sunday League, Phil taking the reigns as manager. The following year, 1993, Uplowman then joined the Devon and Exeter Football League with Richard Norman as manager. 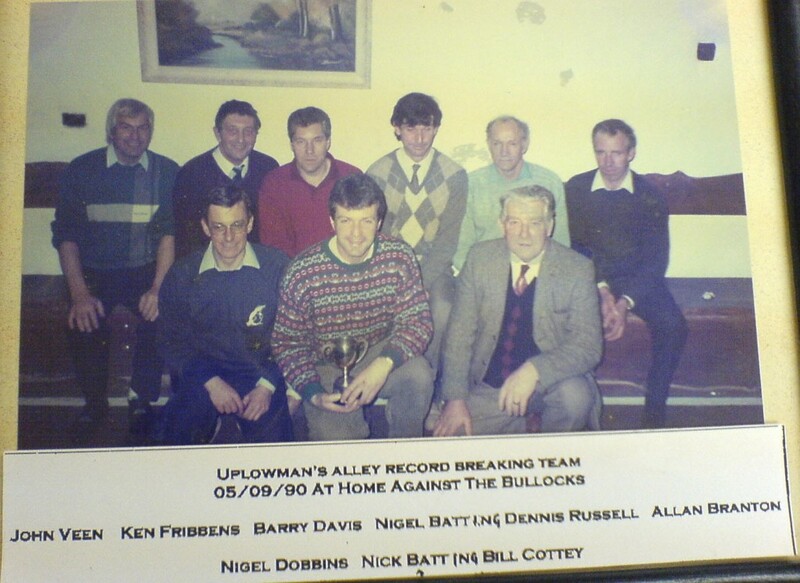 Geoff Holley, who still watches every game he can, was the first ever chairman of Uplowman. Derek unfortunately had to sell the field. Another chat in the Redwoods followed, Andy, Pat Adcock and John Crook discussed building a new village hall, a meeting soon followed and with various grants a new hall with changing facilities was built. The club has steadily progressed through the league. A reserve side was introduced when Ashley Perrot came forward looking to run a team in 2002. Ashley’s team had successive promotions and has since had more success under Mark Washington winning the East Devon Area Intermediate Cup in 2008. Many other well known names in the Tiverton footballing circuit have been connected with Uplowman over the years such as Darren partridge, Jamie Gibson, Gordon Mitchell, Steve Hill, paul Belworthy, Craig Mogford, Ian Edgcumbe, Simon Budden and Ben Hellier (current longest serving player to name but a few. More recently quality players like Kevin Mills and Bret Andrews have joined the club which goes to show how far the club has come since 1992.